It was another ride day for me, and another ride for Quickie - 50 miles, gasp! Loop 1 started with a short but steep climb up onto the northern flats, and I left the starting line a wee bit early, leading Quickie up on foot, laying hoofprints along a new trail I'd flagged a few days earlier. Halfway up the hill, where the trail became obvious, I peeled off my jacket (warm from the climb) and waited for all the 14 other 50-mile riders to follow wo I could point the way. I climbed aboard Quickie and followed the last two in the golden sunrise, and I had the great pleasure of spending most of the day with Jacinta Denton and her gorgeous gelding Krasniy Kumeer. The perennially-hilarious Jennifer LeBlanc was in our company for half of the first 19-mile loop, out on the northwest side of Pickett Creek, to the base of the Owyhee mountains, past "Booby Rock" (a tamer name than what we normally use), where Jennifer took a picture of 4 of us, across Pickett Creek, and back toward home on the southeast side of the creek. Going out we used a new trail I'd never been on, or even seen - an old canal that was probably dug in the 1800's and that provided some nice footing. On the flats approaching Pickett Creek Canyon, Steve Bradley had set up to take pictures. We spaced out for photos. Quickie had been fairly agreeable heading out on the trail, but the closer we got to home, the feistier she got. All of Jacinta's photos had been at the trot on Kumeer, and she wanted a cantering picture, so she nudged him to a higher gear in front of us. Quickie thought she was being left behind, so Steve almost got a picture of me getting bucked off Quickie. I hung on, but it was a bit of a wild ride the last two miles back into camp. I wasn't so sure I'd get Quickie to leave camp two more times today! Loop 2, at 14 miles, was up along the Rim Trail again, though this time, Steph added a short half-mile detour through the Pickett Canyon Narrows. She had debated about it for a while, but decided the very rocky path would be worth the terrific canyon scenery. Red rock walls rose above us as we entered the narrow mouth, and we walked right up the middle of the rocky creek (a bit of water up here), ducking under overgrown vines (fortunately not poison oak, as I found out first hand clearing the trail! 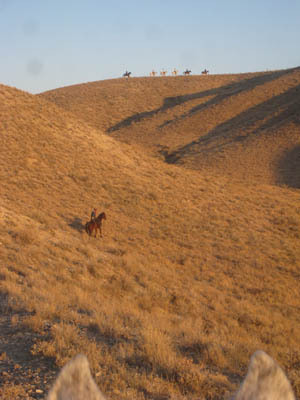 ), and finally coming out past the cliffs through the sagebrush, and up and over a little pass that dumped us back onto the regular Merri's trail that led out of the canyon and up onto the flats. We did the Rim Trail to the north this time - doing trails backwards here in the high desert make them look like completely new trails at times - but with some of the same company, Nance and Jazzbo, Tom and Frank. It was getting warm, and Quickie already has a winter coat started (does this mean it's going to be another early, cold, and long winter again? ), so we took advantage of all the plentiful water troughs and dunking buckets (delivered and kept filled by neighbors Carol and Rick) out there, Quickie drinking and me sponging her. We were joined by Chris Yost - on his backup horse Meadow Manasseh, as his 4-day horse Turbo BLY was sore this morning from a stone bruise. Kara Yost was also done after 4 days, her horse being sore from scratches. Chris had been near the front of the pack this morning, but he and Naomi Preston had taken a detour along the wrong trail this morning, and had done some extra miles. It sounds easy, following ribbons, especially if the trail is well marked... but what is easy is spacing out, losing your concentration for a short time. As Tom said, "It takes only one ribbon!" and you're going the wrong way. Quickie got even feistier heading home on this loop, as we were in a group of 4 or 5 riders, and Quickie was in back. No chance of me taking any more pictures now, and instead a good chance of Quickie getting mad enough to buck me off - and I had no carrots to bribe her with! 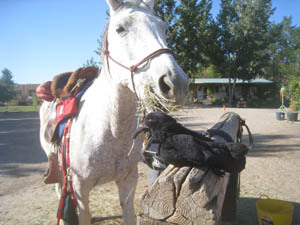 But we made it into camp with me still on top of the saddle, and after our vet check and 50 minute hold, Quickie and I waited for Jacinta to go out on our last 10 mile loop. 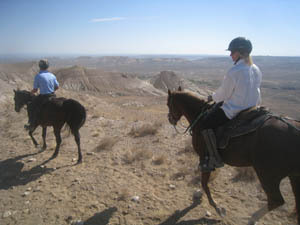 Nance and Tom had gone out ahead of us, so it was just Jacinta and I, and Quickie once again didn't seem to mind going back out on the trail with Kumeer. 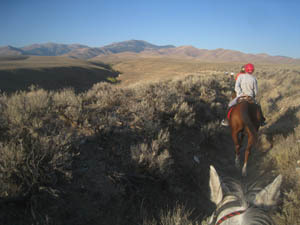 We trotted along the rim above Bates Creek Road, and were caught by Paul Wells, on his 5th day of riding 2 different horses. His wife Laurie was very disappointed she couldn't make it to this ride. Something about girlfriends having scheduled a vacation this week. Don't friends and family members know by now to schedule vacations and weddings and babies around the endurance ride calendar? We crossed Bates Creek Road, worked our way back up onto the flats, and headed in the direction of the purple-blue Owhyee Mountains, trotting fast and steadily, following clouds of dust that whirled up into the air and that must have been seen for miles around. "You couldn't be an outlaw here!" Jacinta commented. Quickie was in a better mood on this loop - she probably knew it was her last one, and she had just Kumeer for company, not a herd to stir her up. I never forget to be amazed at these endurance horses I ride. Mile after mile, they go, and go, and keep going. 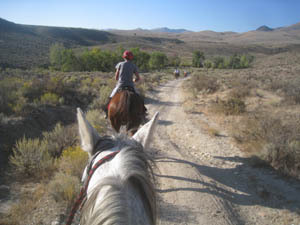 Quickie was not at her fittest, but we flew along in her big half-Orlov trot, pounding along the trail, for miles without easing up. Another thing that amazes me about endurance riding is how the horses make everybody feel - young and old people, sick and healthy and injured people - it's just good for the body and soul. "You know," Jacinta said. "I look in the mirror, and see that I'm old. But when I'm out riding a horse, I feel just like I did 30 years ago." 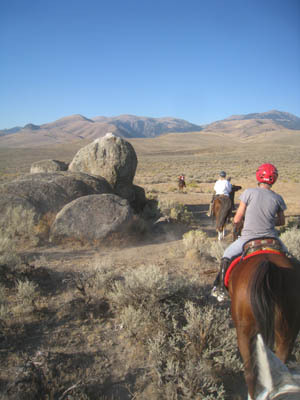 Riding an endurance horse challenges your body and mind, and lets you share the amazing ability of a horse that will willingly (most of the time) goes 15, or 25, or 50, or 100 miles down a trail, year after year, (this is Quickie's 11th season of endurance riding) on trails that you'd never bother to go out and see on foot. And when we got to the top of the Pickett Creek Canyon, once again I got off Quickie and led her down the hill, and stayed off of her and walked her on in to camp, because she'd done enough today, and I knew I'd be fighting to hold her back on the way in! 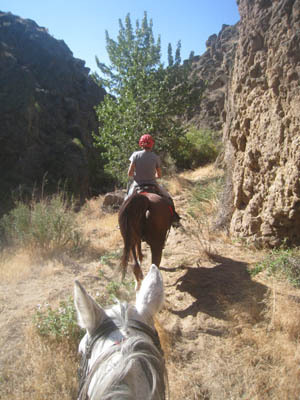 Many personal and equinal milestones were reached at this year's Owyhee Canyonlands ride. Cindy Bradley, who's been plagued with health problems for at least the last year that have prevented her from riding, rode her first 50 since then on day 1, and rode and completed again on days 3 and 5. As Steph said, "She's back!" 18-year-old Frank, with Tom aboard, reached his 4000 mile mark, and with the look of him, he could easily and happily go another 4000. 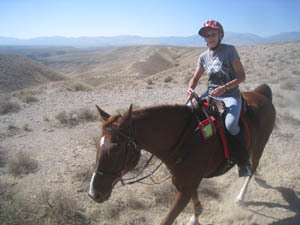 Barbara Holmes, who with her husband Grant came down from Canada, made it a tradition of riding Rhett on her birthday (and after very recent knee surgery), having a great time and finishing second on the LD today. Five riders completed all five days of the LDs (Robert Bischoff and Chocolate Ice, Carol Bischoff and Kenlyn Steele, Melanie Olmstead and Bold Again, Janet Tipton on the mustang Lady Jasmineh, and Vicky Green on Shiloh), and four riders completed all 5 days of 50's (Naomi Preston on Karlady, Kim Black on Smooth, Nance Worman on Jazzbo, and Tom Noll on Frank). For the second year in a row, Naomi and Karlady were the overall 5-day winners, and they took home the overall Best Conditioned prize also. And of course, most importantly, the Raven completed another 155 miles.